Today we filed a brief for the Free Speech Coalition and a large number of nonprofit orgainzations opposing efforts by the Attorney General of California to compel the disclosure by nonprofit organizations soliciting funds in that state of the names of their largest donors. Today, on behalf of the Free Speech Coalition, we sent a letter to Congressman John C. Fleming, M.D., expressing the Free Speech Coalition’s support for H.Res. 828, the House’s impeachment of IRS Commissioner John Koskinen. On behalf of Free Speech Coalition, we filed Reply Comments in Postal Regulatory Commission Docket No. PI2008 4 opposing broadening the cooperative mail rule to impose significant burdens on new and smaller nonprofit organizations. James E. Ryan, Attorney General of Illinois v. Telemarketing Associates, Inc, et al. Bill Olson co-authored an article entitled “Making a Bad Law Worse: New York’s Amended Charitable Solicitation Law” with attorney Mark J. Fitzgibbons for The Philanthropy Monthly, Volume 35, Nos. 1 & 2, December 2002. 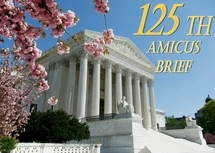 Our firm filed an amicus brief for the Free Speech Defense and Education Fund, et al. in the case of American Target Advertising, Inc.v. Francine A. Giani in the United States Court of Appeals for the Tenth Circuit in support of appellant. Our firm filed an amicus brief for the Free Speech Coalition, Inc. in the case of National Awareness Foundation v. State of New York in the U.S. Court of Appeals for the Second Circuit.